Tariq van Rooijen (TNO) welcomed the 45 participants. Planned or current initiatives include low emission zones, bans on large vehicles (>7.5T) from the city centre, incentives for electric vehicles (e.g. parking on sidewalks and subsidies). The city is also interested in introducing a congestion charge; however that is not currently permitted in national legislation. 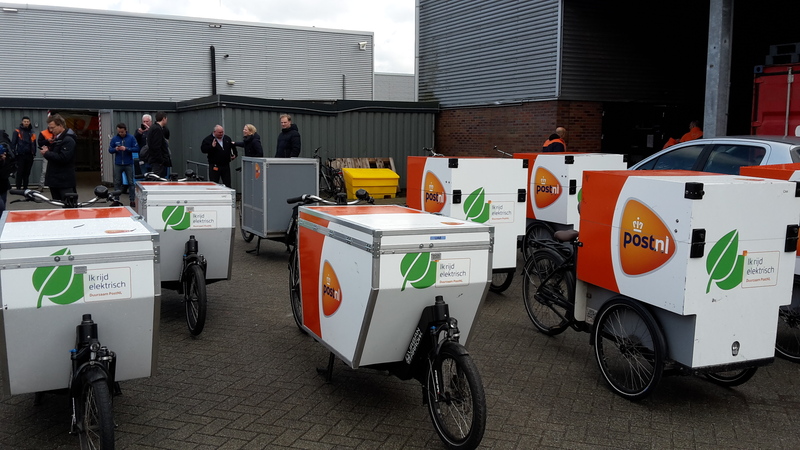 Laurens Tuinhout (PostNL) described their journey throughout the Citylab project from the original concept of using a floating depot on the canals to the present-day use of micro-hubs and innovative freight bikes. The floating depot remains of interest if costs can be reduced (e.g. by using a roboboat) or if the alternative becomes unviable (e.g. if trucks are banned). He mentioned that the city plays an important role and use their procurement power to force use of consolidation hubs and zero emission vehicles operating out of them and that many more micro-hubs will be needed to cope with future demand. PostNL currently run an urban consolidation centre at Deudekom, Amsterdam. 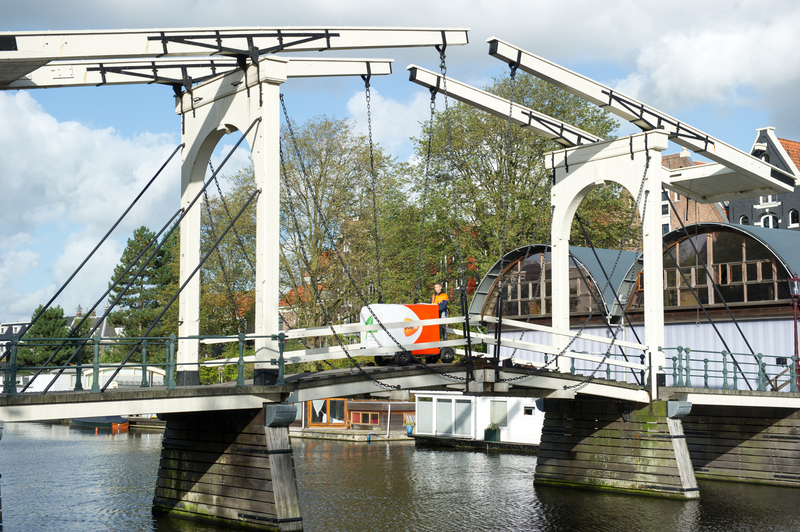 In the Q&A, it was observed that canals and quayside space seem to be very busy; however, PostNL were able to identify some suitable berthing locations. The use of a swap body may be considered although an issue would be the requirement for cranes. Some competitors already use canals, for example DHL use them for transporting small parcels and using cubi-cycles. 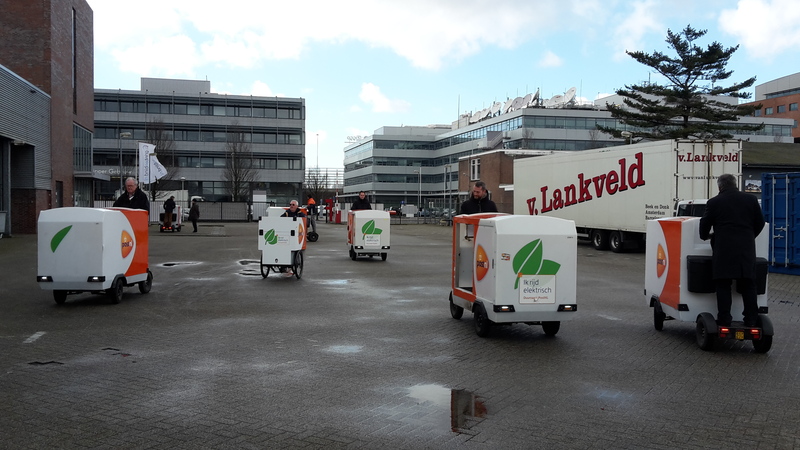 Nanette Wielenga (PostNL) presented the bikes and stints (segway) they use and the daily operations they undertake. Bikes can save time as routes can be shorter and avoid traffic congestion. PostNL own 6 of the 7 micro-hub locations they are currently using, the other being rented. They make around 1500 orders/day covered by 24 rides in the morning and 36 in the evening. They have learned by doing. Laetitia Dablanc (IFSTTAR/Université of Paris-Est) presented some of the more challenging social issues of fulfilling instant deliveries using bikes, drawn from a comprehensive study undertaken within the Citylab project and reported in detail here. A survey of 100 bike riders revealed their main concerns, including personal safety, poor weather conditions, bike theft, bike problems, having to wait for food to be ready, poor road infrastructure (e.g. potholes, lack of bike lanes), pollution. Poor working conditions have led to protests, strikes and legal challenges, mainly in the USA and UK, although it can be difficult to organise collective groups. Such issues are now also being discussed within French legal circles. Some road safety statistics now segregate delivery riders as a distinct category which will provide evidence of a safety issue that has been invisible to date. 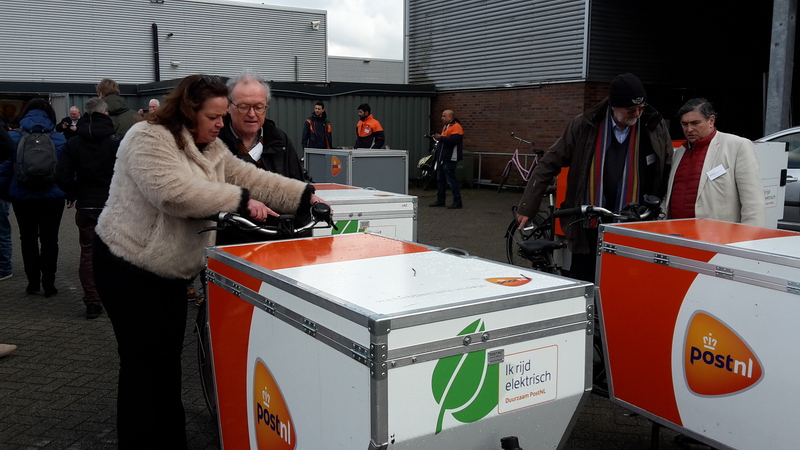 This provided the participants the opportunity to see and ride the bikes and stints at one of the hubs used by PostNL. As many people attended, the largest of their hubs was chosen for the visit, located at Sloterdijk, Amsterdam. 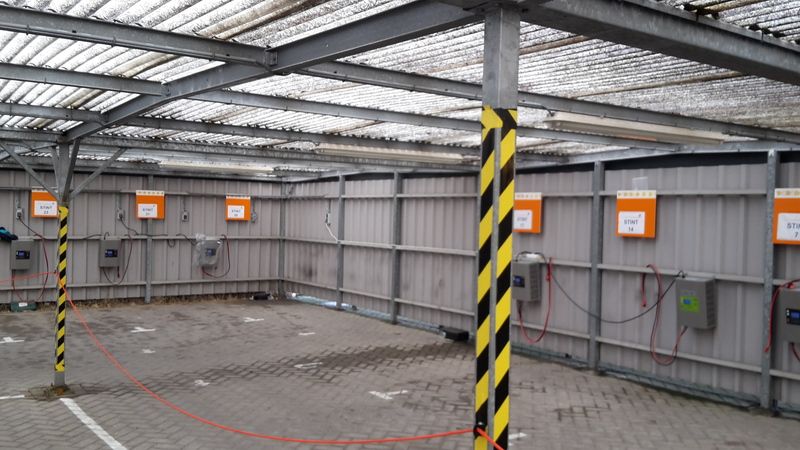 This facility includes a covered area for charging of vehicle batteries.